The My Tablet 7, a 7-inch Android tablet from Xtex, is gunning for the Kindle Fire, undercutting Amazon’s device with a $150 price tag and topping the Fire with some specs. The My Tablet 7 may not be the best-looking tablet around but it comes loaded with the latest version of Android Ice Cream Sandwich, 4.0.3, and a 7-inch display with 800-by-480 pixel resolution, which is below the $200 Kindle Fire’s 1024-by-600 pixel display. The Xtex tablet also runs on a 1.5GHz processor under-clocked to 1GHz, while the Fire runs on a 1GHz dual-core chip. From here on, it gets better. The $150 tablet runs on 1GB of RAM, double what’s inside the Kindle Fire, and also double the Fire’s built-in storage, starting at 16GB, and expandable via SD card with an additional up to 32GB. It’s also slightly lighter and thinner according to the manufacturer’s specs. There’s a 2-mgepiaxel front-facing camera for video chats, notably missing from the Fire, but there’s no camera on the back. The tablet has, however, a variety of ports: there’s a full–size USB port, a mini USB port and a mini HDMI port that can output 1080p HD videos. Battery life could make or break My Tablet 7, but no official battery tests have been performed. Xtex says that it under-clocked the CPU so that the 3200Mah battery can give between 5 and 6 hours of use, which is at its best still below the 7 to 8 hours you can get on a Kindle fire, given that you have Wi-Fi turned off (you can get substantially less with Wi-Fi on). The Xtex My Tablet 7 is not a bad tablet for its price, if you are looking for something low-end for kids to play games on or watch videos and download apps. $50 extra would get you a slightly better screen and battery life with the Kindle Fire or the Nook Tablet, with their own app stores and content ecosystem. 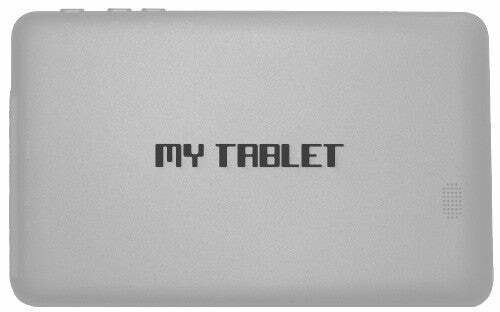 But if you can get over the average screen and battery life, for $150 you can get a My Tablet 7 in black, white or pink. It’s not available yet in any stores, but it can be ordered online, with an estimated shipping time of 7 to 10 days. Cheap and small Android tablets seem to be gaining momentum. Amazon sold more than 3 million Kindle Fires, more than any other Android tablet manufacturer, while Samsung is prepping its own small and inexpensive tablets. Even Google is working on its own cheap Android tablet, to sell it for under $200.